Woodbridge isn’t quite on the Suffolk coast, which is probably why it’s so often overlooked, but it’s right on the river Deben with fabulous boating opportunities and a working tide mill. So the best places to stay in Woodbridge make ideal bases if you're looking for a holiday full of water based pursuits. Woodbridge has an historic riverside market which is a great place to pick up some lovely local produce. And it’s very close to one of the UK’s most important Anglo-Saxon sites, the excavated burial mounds of the Sutton Hoo. Many of the Sutton Hoo’s treasures are now housed in the British Museum, but the Woodbridge Museum is still home to some and to some excellent replicas. There’s also a detailed exhibition about the 1939 find and its relevance. Woodbridge’s other claim to fame is as a ship-building and rope-making centre and Edward III and Sir Francis Drake both had vessels built here. Woodbridge is just a small town but it’s has some impressive Tudor, Georgian and Regency architecture. 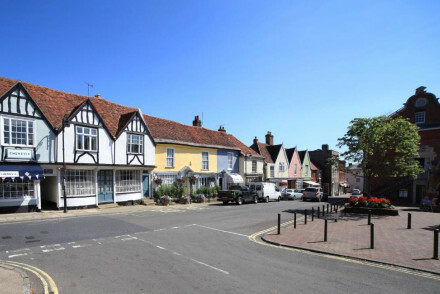 Peaceful and charming, many of the best places to stay in Woodbridge offer a perfect Suffolk break opportunity, with great food and ale, in a great location. 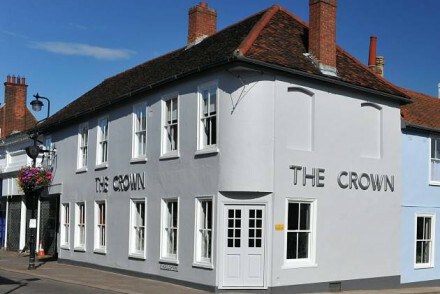 The Crown at Woodbridge is a chic gastropub with ten rooms. The interiors are cool and luxurious and the restaurant is great - offering plenty of local produce including Suffolk ales to wash it all down with. Romantic and foodie-friendly. 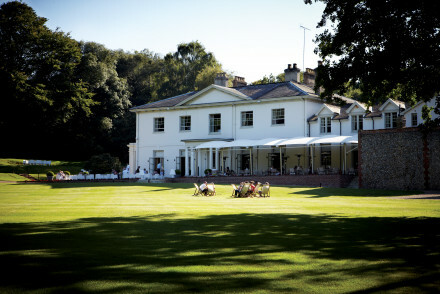 A bit out of town, Kesgrave Hall is a handsome Georgian house converted into a charming 23 room hotel with a bustling bar and brasserie and a great terrace - when the weather is right. Commandeered as a American Air Force base during WW2, it’s also been a school. Today there a relaxed family-friendly atmosphere, lots of bold fabrics, art by local artists and great lighting. 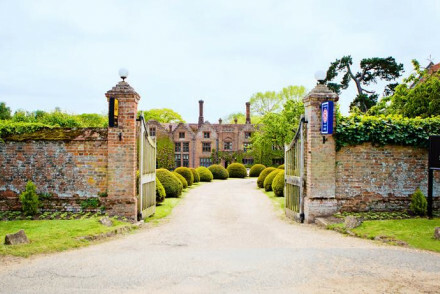 Seckford Hall is a beautiful historic property just outside Woodbridge with 32 rooms and suites. Set amid gorgeous manicured gardens and boasting both an excellent restaurant and newly refurbished spa, it's perfect for a luxury getaway. If you'd prefer a self-catering option this holiday, don't hesitate to visit our online partner Booking.com for a selection of properties perfect for exploring this charming town. Fly to London Stansted Airport located 93km (58 miles) from Woodbridge with a range of domestic and International connections including to Europe and Africa. Or catch a train to Woodbridge with rail links to major destinations including Ipswich. Best time to visit - the summer months from June to early September provide typically the nicest weather for enjoying the nearby beaches and countryside. Alternatively, you can expand your search and check all our Suffolk recommendations.